Asthma is a reversible lung disease that affects approximately four million people in the United States. It is sometimes referred to as a disease of twitchy or reactive lungs, which means that the airways of the lungs are extremely sensitive to irritants such as pollen, animal dander (hair, feathers, or skin), dust, or tobacco smoke. When these irritants are inhaled, the airways react by constricting or narrowing. In some people, asthma attacks follow a cold or a severe respiratory infection. Stress, exercise, and even changes in temperature or humidity can bring on attacks of asthma, as can certain drugs such as aspirin. Some people with asthma have only mild symptoms that occur from time to time. Others have symptoms that occur frequently and that can be mild, moderate, or severe in nature. Severe asthma attacks are sometimes life threatening. Although researchers have learned more about the underlying causes of asthma in recent years, there is no specific treatment for the disease. In fact, deaths from asthma are on the rise. Many experts believe that lack of standard treatments and inconsistent monitoring of asthma patients have contributed to this increased rate of death. 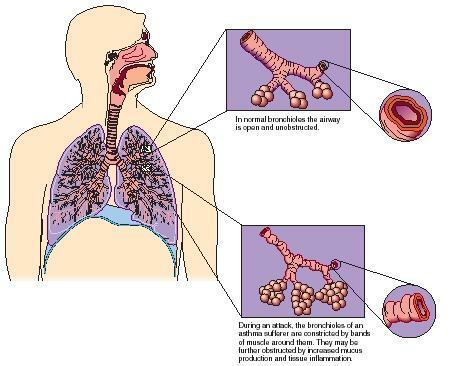 The airways are tubes called bronchi that branch into smaller tubes called bronchioles. They carry air from the windpipe to the lungs. During an asthma attack, the airways are narrowed due to muscle spasms, swelling and inflammation of the airway walls, and the production of large amounts of mucus. This results in a blocking of the passage of air to the lungs. The characteristic sign of asthma is wheezing, the noisy whistling sound that a person makes as he or she tries to push air in and out of narrowed airways. Other symptoms include the sensation of a tight chest, shortness of breath (breathlessness), and a cough. Treatment of asthma aims at opening the airways and reducing inflammation. There are two general categories of medications used to treat the disease: those that bring quick relief in the sudden onset of an asthma attack and those used long-term to control persistent asthma. The treatment used may vary from patient to patient, based on individual need. While an inhaler may be used occasionally in very mild cases, often a combination of drugs is prescribed for moderate to severe forms. Extremely severe, or acute, attacks of asthma may require the patient to be hospitalized. Bronchi: The two main airway tubes that branch off from the windpipe and lead to each lung. Bronchiole: Any of the smaller airway tubes that branch off from the bronchi. Bronchodilator: A drug, either inhaled or taken orally, that widens the lung airways by relaxing the smooth muscles of the airways. Constriction: In asthma, the characteristic narrowing of the airways. Bronchodilators are drugs that dilate, or widen, constricted lung airways by relaxing the smooth muscles of the airways. They can either be inhaled through a special device or taken orally (by mouth) in pill form. Inhaled bronchodilators are usually prescribed for mild to moderate forms of asthma. Because they are applied directly to the constricted airways, they act quickly; the patient is instructed to inhale the drug as soon as he or she feels an attack coming on. Oral bronchodilators are longer acting and are usually prescribed for severe asthma. A new, longer-acting bronchodilator called Salmeterol™, which is inhaled, combines the direct effects of inhaled bronchodilators with the long-lasting protection of oral ones. It is useful in maintaining clear airways and in preventing nighttime flare-ups of asthma, as well as those caused by such stimuli as exercise and changes in temperature. The inflammation associated with asthma has a direct effect on lung function. Increased emphasis has been placed on the use of anti-inflammatory drugs to reduce swelling and inflammation of the airways. In cases of persistent asthma, it is often recommended that anti-inflammatory medications, such as corticosteroids (pronounced kor-tik-oh-STEH-roydz), be taken on a daily basis. They can either be inhaled or taken in pill form. breathing. Cromolyn™ is used to prevent asthma attacks rather than as a treatment during attacks. The key to managing asthma and preventing attacks is the patient's ability to recognize the factors that trigger an attack—and then making the conscious effort to avoid them. Since allergies and asthma often go hand in hand, allergy testing may be an effective way to identify allergens (allergy-causing substances) in some patients. If asthma is brought on by exercise, finding a level of exertion that is comfortable or using an inhaled bronchodilator before exercise may help to control symptoms. Taking medicine as prescribed is also an important factor in maintaining control of the disease. For all persons with asthma, the most important aspect of managing their disease is communication with and regular visits to their physician. It is essential that patient and physician work together to monitor progress and keep abreast of any changes in the patient's condition. THE MOMENT I'VE SEEN THE SITE, IT HAS THE MOST CONCISE AND CLEAR EXPLANATION ON EACH CASES OF PATIENT WHO HAS AN SPECIFIC DISEASE. THOSE STUDENTS, MEDICAL PRACTITIONER WILL HAVE A GREAT RESEARCH WHEN THEY VISIT THE SITE.